Maintenance responsibility for unpaved public roads most often rests with local officials, who must balance resources spent battling dust control with other pressing needs. 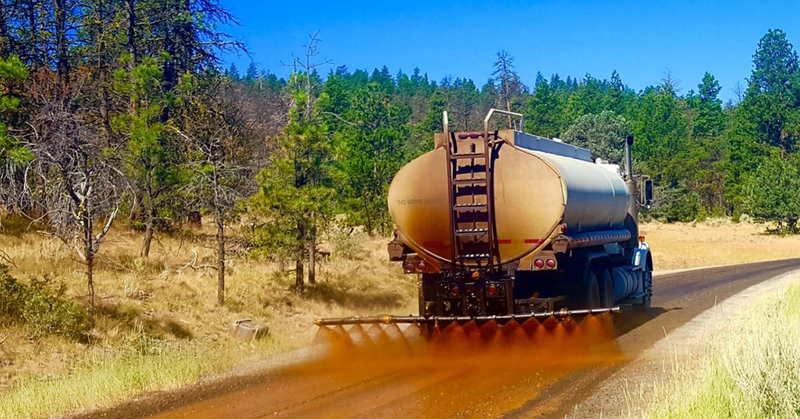 Fortunately, when Dust Control applications are weighed against all other budget priorities, for the highly traveled public unpaved roads the investments in suppressing road dust are repaid in significant direct and indirect benefits. Dust Control can help in reducing the amount and cost of a limited resource, applying gravel to roads. Studies have shown that between 1-2.6 tons of aggregate per mile is lost each year for each vehicle that passes over an untreated road daily. This means that an untreated road carrying 200 vehicles per day will experience the loss of 200-520 tons of aggregate/mile each year. Dust Control treated roads tend to lose about 35-50% of the gravel lost by untreated roads. Field tests in the past have shown that when a dust suppressant is used to control dust on gravel roads, blading frequency may be decreased by up to 50%. Field trials outside of the U.S. revealed that the anticipated interval between re-graveling was extended from 7 to 14 years when roads were treated with a dust suppressant. Of course, this will vary based on climate, rainfall, quality of the gravel and other factors. Additional Benefits: Improved safety, Increased driving comforts, Healthier air quality, Cleaner adjacent property and Extended road life. Assuming an unpaved road with the length of 1 mile and width of 22 feet with AADT of 200 vehicles. Your Numbers will vary but this should provide some directional guidance for the cost savings for an aggregate replacement that can be experienced when applying Dust Suppressants vs. leaving an unpaved road untreated. Keep tuned in as next Month we will dive deeper into some of the hidden costs of using water as a Dust Suppressant. The aggregate loss was derived from two studies below. ** According to Road Dust Suppressants Research Results, Thomas G. Sanders and Jonathan Q. Addo, Department of Civil and Environmental Engineering, Colorado State University, Fort Collins, CO 80525. Project Engineer, Hewlett Packard, Fort Collins, CO - the Average Aggregate loss for untreated road = 2.6 tons and for treated road = 1.2 tons (based on 1 application per year). ** EPA Study uses 1 Ton per Car per Year. An Average between the two studies were used. Need assistance with a similar project? Contact us for more information.